QueIt for Microsoft Windows® is a powerful scheduling utility that allows you to schedule programs or tasks to automatically launch at specified times. 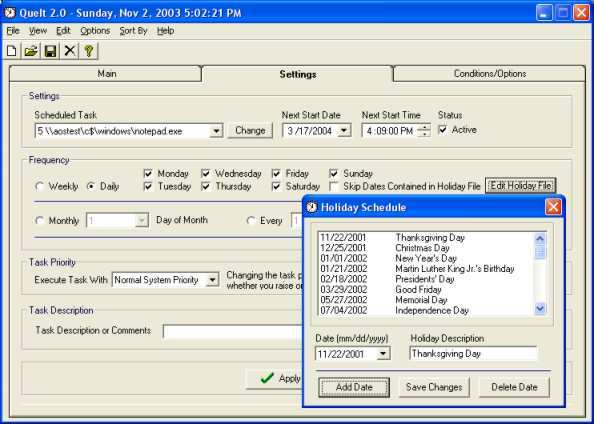 QueIt is a powerful scheduling utility that allows you to schedule programs, tasks, or even MS-DOS batch files to automatically launch at specified times you choose. With QueIt, you can also send automatic e-mail messages, execute tasks remotely (i.e. different machines on your network), pass command line arguments to your scheduled program. QueIt even supports conditional launches (i.e. don't execute unless a specified file exists). Schedule tasks to launch when you want. With QueIt you are able to schedule a program, task or batch file to run every month, day, hour or even every minute. Tasks can be scheduled day or night! Send automatic email messages. An automatic email message can be sent to one or more specified email addresses at the time a task is launched or completed. Execute tasks remotely. With the QueServer add-on, you have the ability to execute tasks on diffrent machines contained on your network. Once QueServer is installed, it will "listen" for instructions from QueIt to execute tasks locally on the machine QueServer is installed on by using the CPU of that machine and not the machine QueIt is installed on. By installing QueServer on several machines, you are able to distribute the processing of multiple tasks across multiple machines and are only required to have one install of QueIt that sends instructions to the remote machines that have QueServer installed on. Only launch a program if a specified file exists. For example, you want to launch Microsoft Excel® ONLY if a file by the name of "today.txt" exists in a specified folder, QueIt would wait until this file exists prior to launching Excel. You can have QueIt wait indefinitely or you can set QueIt up to have the task "time out" after a specified number of hours. Automated reminders. With QueIt you can schedule reminder messages to popup on you screen. You can also configure QueIt to auto-email a reminder message to one or more email addresses. Automatically stop a task. You can configure QueIt to stop a task after it has been running for a specified number of hours or minutes. For example, if you scheduled Microsoft Internet Explorer to launch at 8:00 AM and then selected the "Stop Task After" option with a value of 1 hour, QueIt would launch Explorer at 8:00 AM and then close Explorer at 9:00 AM. Provide command line arguments to the program that is being scheduled. For example, if you schedule Microsoft Excel with a command line argument of "my_spreadsheet.xls", QueIt would then launch Excel and open the "my_spreadsheet.xls" spreadsheet. Detailed log information. QueIt logs every task that is successfully launched or any task that fails to launch. Launch a task with "High System Priority". Launching a task with high system priority will enable certain applications to run faster on your CPU. You can also launch tasks with "Low System Priority". When minimized, QueIt runs unattended and remains as an icon in your system tray. If your computer is shutdown, QueIt will automatically be restored once your computer is re-booted. Run QueIt as a Windows Service. If you have Windows XP, Windows 2000 or Windows NT, you can run QueIt as a Windows service. This option will allow you to launch tasks even when your logged off.